GALVESTON, Texas -- A man charged with abducting a missing University of Virginia sophomore has been captured in Texas and is awaiting extradition - but there is still no sign of the student, authorities said. 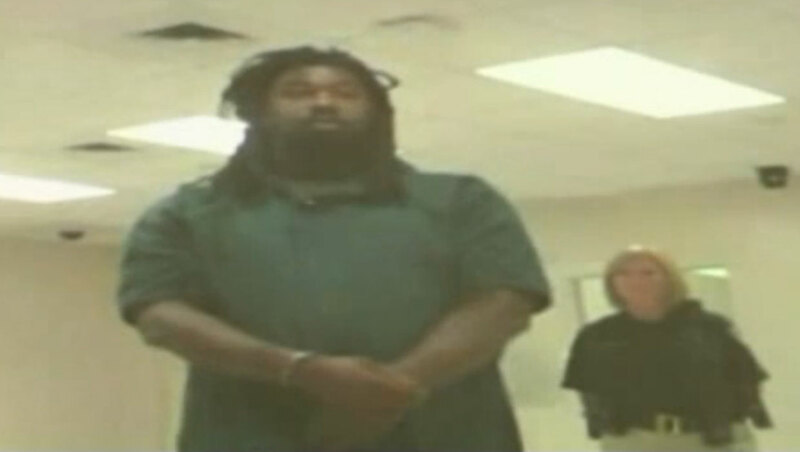 On Thursday morning, Jesse Leroy Matthew Jr., 32, appeared briefly before a Galveston County judge via a video link from jail to hear the charges against him. In Texas, he's charged with being a fugitive from justice and with giving false information to an officer, in addition to a count of abduction with intent to defile in Virginia. Judge Mark Henry set bond at $1,500 on the false information charge but held Matthew without bond on the fugitive count. Matthew denied a court appointed lawyer and waived his right to an extradition hearing, reports CBS affiliate WTVR. He'll remain jailed until Charlottesville police can come get him in Texas, expected to happen in the next two days, reports the station. Matthew - in a dark green jumpsuit, with his hands cuffed - signed several papers and told Henry that before his arrest in Texas he was not out on bond on any other charges. Matthew asked the judge a few short questions and expressed concern that his clothes were taken from him when he was booked into the Galveston County jail. "I should be able to have some kind of clothing," he said. Henry told him that his jumpsuit was sufficient clothing and that his personal items would be returned later. Matthew was arrested Wednesday afternoon on a beach in the sparsely populated community of Gilchrist by Galveston County Sheriff's authorities, Charlottesville Police Chief Timothy Longo said. The capture came less than a full day after police announced they had probable cause to arrest Matthew on charges of abduction with intent to defile Hannah Graham, an 18-year-old sophomore who went missing on Sept. 13 in Charlottesville. A federal law enforcement source told the station a phone call placed to Virginia from a borrowed cell phone in Louisiana is how police first discovered Matthew was out of state and on the run. Police received a call reporting a suspicious person and a responding deputy found a man who had pitched a tent on the beach with his car parked nearby, the Galveston County Daily News reported. Galveston County Sheriff Henry Trochesset told the newspaper that a check of the car's plates revealed it was the vehicle sought in connection to the case. Authorities were trying to get a warrant to search the car, he added. In Charlottesville, police say an intense search for Graham continues. "This case is nowhere near over," Longo told a news conference late Wednesday. "We have a person in custody, but there's a long road ahead of us and that long road includes finding Hannah Graham." The search is focusing on rural and wooded areas around Charlottesville, Longo said Thursday on NBC's "Today" show. According to authorities, Graham met friends at a restaurant for dinner Sept. 12 before stopping by two parties at off-campus housing units. Officials said she left the second party alone and sent a text message to a friend saying she was lost. Surveillance videos showed her walking, and at some points running, past a pub and a service station and then onto the Downtown Mall, a seven-block pedestrian strip where police believe she entered a bar with Matthew. Police have previously said Matthew was seen on surveillance video walking with Graham on the mall, and they believe she later went to a bar with him and may have been in his car when he left the area. The video that has been publicly released does not show the two entering the bar together, but police said witnesses saw them there. Police believe Matthew bought alcohol while the two were at the bar. The university said Matthew had been employed at the University of Virginia Medical Center since Aug. 12, 2012, as a patient technician in the operating room. The charges against the 6-foot-2, 270-pound Matthew surprised Dave Hansen, who first met him about 11 years ago when Hansen served as an assistant pastor at an area church. "I always thought he was a gentle giant, just a nice guy," Hansen said. "He seemed genuine with his faith and spirituality. ... I don't see him doing this at all, but that's usually the case, I guess." Hansen said he's only kept up with Matthew through Facebook but ran into him at the university's medical center within the last year. He said the soft-spoken Matthew greeted him in an elevator with a high-five. More recently, he also served as a part-time volunteer for the football team at The Covenant School, a private Christian pre-kindergarten through 12th-grade school in Charlottesville. Officials said his involvement with the school began last month following interviews with the athletic director and head football coach, as well as normal background and reference checks. After Matthew was named a person of interest in Graham's disappearance, school officials said in a letter that he will "no longer be working with our football program while this matter is being clarified and resolved." While Matthew has had past brushes with the law, the details of those cases are not clear. Online court records show Matthew was convicted of trespassing in 2010 but provide no details about the incident. Details also were unavailable for two other charges of assault and attempted grand larceny relating to a 2009 incident that were not prosecuted. Matthew, who had a taxi permit from the Virginia Department of Motor Vehicles from 2007 through 2010, also has several traffic infractions, records show.